The Library inside the base sponsors program every year for kids. 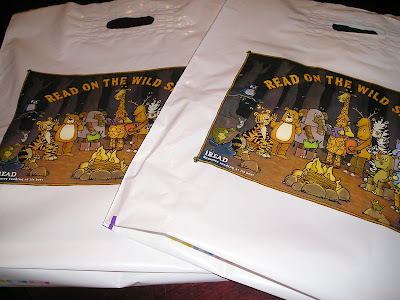 This year's reading program was dubbed as "Read on the Wild Side." Whoever reads a great number of books has prizes. 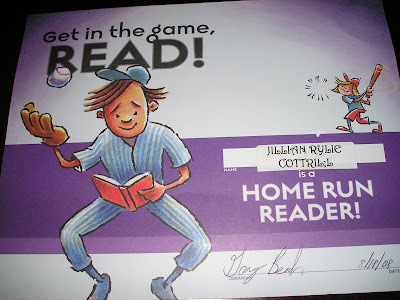 Me and Rylie read her books at home but I always forgot to log it in the paper so we did not get any prize hehehe. But as a participant, both of them got each a shirt and pencils.. Rylie got a certificate. Herre's the certificate and other blahs..
Last year's reading program was dubbed as... That's Rylie's certificate for last year. 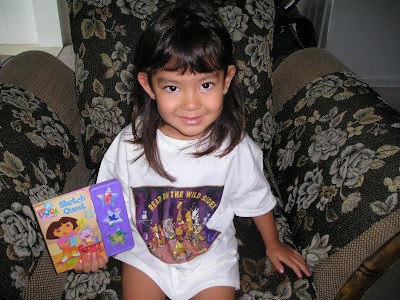 Here she is modeling the shirt lol.. Good job reading Rye. Speaking of reading, I was teaching her to read three letter words yesterday but after a while she got tired and said "I am not ready for a lot of stuff Mom." I felt guilty that I was pushing her too much into learning. Today is suppose to be a family weekend day but hubby is in training so me and the kids just went outside and play a little bit, taught Rylie some basic Math and then we came in, it sooooo hot outside! Happy weekend everyone! Cute ni Rye sa picture. Morag naa man "kotex" ang mga kuko ni Rye. Happy weekend to your family! she is very cute, kamukha mo Rose! Hi, sorry for the off-topic, Im needing your input please, you can go as anonymous if you want...thank you!! She is getting so big. I use to share read with my kids and grankids, I would read a page and then they would read a page. It is fun to do things with the children, it builds good memories and relationships. Hope you are having a nice Sunday. Wooow cool activities for kids you got in your place there bakla. Reading is a good activities for kids. 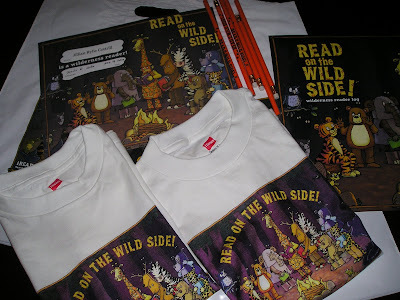 Mahilig pala sa books mga anak mo ang ganda naman, and of course nice freebies too. Ganyan talaga ang kids minsan pero it's better to teach her rather than not di ba?Turuan mo na lang cya if she's in the mood ^_^ Wakaba can now read a book in hiragana--kids are growing up fast!! thanks sa pagdalaw mo sa blogs ko ..
don't feel guilty rose of teaching your daughter.children has a short span of interest. I do a lot of teaching kay erik din, but have to sure na willing siya to listen, pag hindi have not force him. But I always tell him, na i will teach him again pag gusto na niya. I started teaching him how to read 3 letters na rin, but with limitations. usually 2 to 3 words lang itinuturo ko every 3 days.pabalikbalik lang yong words. It's a double-edged sword. When they are young, they learn so easily and so rapidly. At the earliest age, you can really influence the rest of their lives. My concern is that society is pushing kids to grow up faster and stripping them of their childhood. I believe that the simple things in childhood are just as important as the things they will learn in later years as well. What do you guys think? Great loot, Mommy Rose! Happy Sunday!